Look at these cute lil’ cookies! I have been sick for almost the entire month of November. Currently dealing with tonsillitis. Glamorous, huh? Needless to say, I’m over it. Over. It. But I had to bake something for Thanksgiving. I saw these little cookies on Pinterest and decided to give them a try. They were so, so easy. Especially because I, uh, totally took a shortcut and used pre-made cookie dough. And pre-made frosting. Shhh. Don’t tell. 1. Bake your cookies! Allow the cookies to cool completely. 2. Frost each cookie with chocolate icing. 3. Place two eyes on each cookie. Then place yellow & red sunflower seeds on each cookie for the beak and gizzard (is the red thing the gizzard? Maybe?). 4. Make the feathers using any combination of colored sunflower seeds. Halloween is in just a few days! 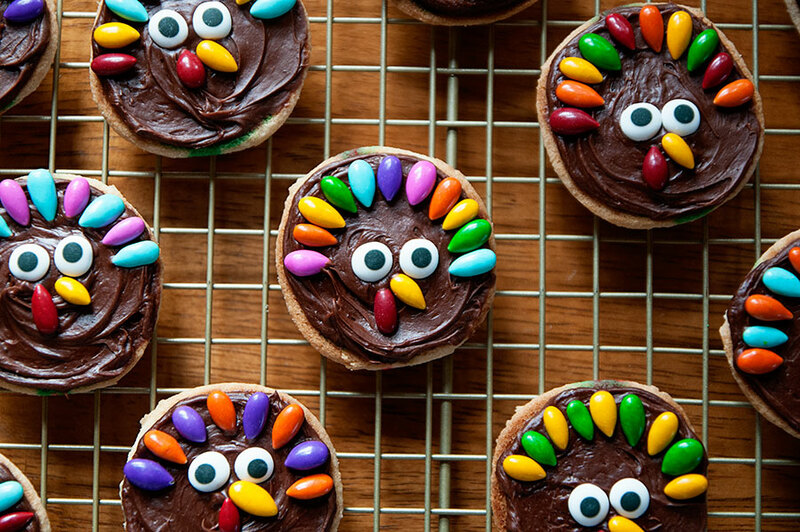 Do you need to make a treat for work or for your kid’s school party? Here are almost all of the Halloween/fall treats that have been featured on my blog throughout the years. Enjoy & have a safe holiday! These cookies remind you of Dexter, don’t they? Dexter was one of the best shows of all time, but also one of the absolute worst (THAT ENDING. AMIRIGHT?! I AM STILL ALL-CAPS ANGRY ABOUT IT.) Dexter, for those of you who don’t know, was a blood spatter expert who worked for the Miami police department. His hobbies included cooking breakfast foods, sulking around like a moody teenager, and oh yeah, rockin’ it as a serial killer. No biggie. You’re intrigued, aren’t you? Netflix the show. The first four seasons are amazing. But it goes quickly downhill from there. Don’t say I didn’t warn you. 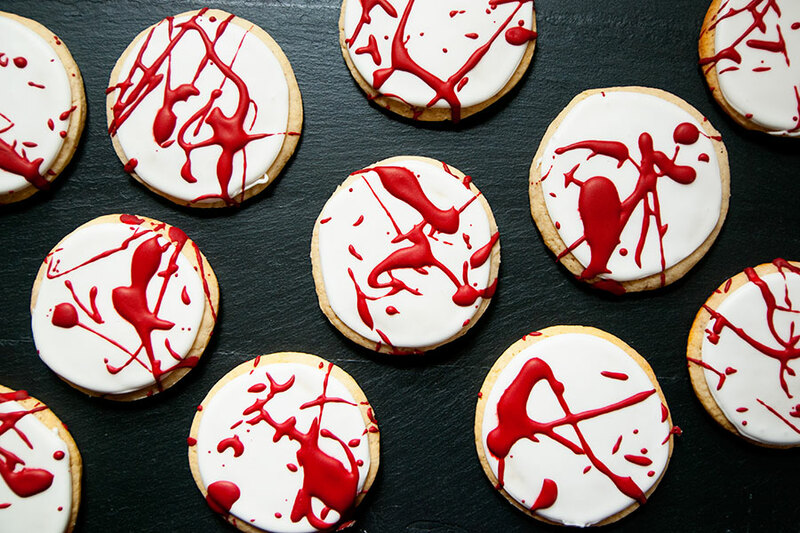 Anyway, what better way to celebrate Halloween than with some ooey, gooey blood spatter cookies?! These were so easy to make and really fun — cause you get to be suuuuuper messy! I used a round cookie cutter — any size larger than 2″ will work. I outlined and flooded with white icing and allowed the cookies to dry for at least a couple hours. Now comes the fun part. Dye a bowl of royal icing red. Use AmeriColor’s Super Red — because nothing else will even come close to blood red. If you can’t quite get your red to be dark enough, add a little black food coloring; but do this very carefully and conservatively because you don’t want to add too much… and have your batch of icing ruined because it’s too dark. Spread a generous layer of paper towels or newspapers all over your kitchen floor. I cannot stress this enough: cover as much of your floor as you can. Set your cookies on the floor. Using a fork, fling the red icing onto the cookies. There’s no great way to explain this. I just scooped up some red icing with a fork and flung it onto the cookies. You’ll make a mess and it won’t be perfect — embrace this! Side note: if you want to take photos of your cookies, don’t wait until the next day. The red icing will bleed (no pun intended) into the white as time goes on. Combine all ingredients in the bowl of a stand mixer fitted with the paddle attachment. Mix on low speed until the sheen has disappeared and the icing has a matte appearance (about 7-10 minutes). Transfer the contents of the mixing bowl to an air-tight container. This will be the stiffest consistency of the icing, and at this point it is still too stiff to use for decorating. Add water a very small amount at a time and stir by hand until fully incorporated. Continue until the icing has reached a consistency appropriate for piping. Depending on how large your cookies are, you may need to make more than one batch of this icing. Here’s the problem with having a 7-year old baking blog: you run out of ideas for certain holidays. Halloween is my favorite baking holiday and I have done it all — candy corn everything, pumpkin everything, ghost cupcakes, skull cookies, you name it, I’ve probably made it. So I really had to think about what else I could do — franken-candy corns! These were simple and I think they’re pretty cute! I used AmeriColor super black gel coloring and AmeriColor’s electric green gel coloring. Divide the royal icing (see recipe below) into three bowls. Dye the icing in one bowl black, one bowl green, and leave the other white. I outlined the cookies with the corresponding colors — black at the base, then green, then white at the tip. Wait a few hours and then flood your cookies. Allow the cookies to dry completely, then pipe black stitching onto each cookie. Easy, right?! Again, if you are unfamiliar with the concepts of outlining and flooding, please check out the links I posted above to Annie’s Eats or Bake at 350. Those cookie goddesses will teach you all you need to know. Beat butter and sugar. Add eggs, sour cream, and nutmeg. Add dry ingredients gradually. Chill the batter overnight or for at least 4 hours. Roll out dough and cut with cookie cutters. Bake at 350F until golden (in true fashion, my grandma didn’t give a specific baking time. I baked the cookies for about 8 minutes). Since these cookies were a bit larger, I would bake them for about 10 minutes. But watch them, as oven temps can vary! Note: you will likely need more than one batch of this icing, especially if the cookies you are making are large. This is one of my favorite recipes — these cookies are so good and so damn simple! So much so that I’ve made them before — rainbow and Christmas! Now they’ve been Halloween-ized. 1. In a medium bowl, whisk together the flour, baking power, cream of tartar, baking soda, and salt. 2. In the bowl of an electric mixer fitted with the paddle attachment, beat the butter and sugar at medium speed until light and fluffy. Split the vanilla bean and scrape the seeds into the bowl (I skipped this step). Add the egg and vanilla extract, and beat until thoroughly combined. 3. Reduce the mixer speed to low and slowly add the dry ingredients to the wet ingredients. The dough will be thick. Fold in 1/4 cup of the sprinkles. 4. Put the remaining 3/4 cup of sprinkles in a small bowl. Scoop up 2 Tablespoons of dough and roll it into a ball (I used a cookie scoop and it worked well!). Dip the ball into the bowl of sprinkles to cover lightly. Put the ball on a plate. Repeat with the remaining sprinkles and dough, and chill the balls of dough for at least 2 hours. 5. Preheat oven to 350F. Line two baking sheets with parchment paper. 6. Transfer the chilled balls of dough onto the baking sheets, leaving about two inches between each ball. 7. Bake until the cookies have spread and are just beginning to brown around the edges, but are mostly pale and soft — about 10 minutes. Let cool on the cookie sheets for 5 minutes before transferring to wire racks to cool completely.